1 Pontificia Universidad Católica de Valparaíso, Facultad de Agronomía, Casilla 4-D, Quillota, Chile. *Corresponding author (mcastro@ucv.cl). Received: 24 March 2008. Accepted: 07 June 2008. The avocado tree (Persea americana Mill.) is one of the species most sensitive to salinity. Since the root system of this species is particularly affected by this type of stress, it is crucial to find a rootstock that is tolerant to saline water irrigation. Plant material from the cv. Hass was grafted on five rootstocks to find possible candidates: the clonal Duke 7, Nabal, Degania 117',Mexicola', and 'Zutano' seedlings. One year-old plants were placed in 55 L pots; river sand was used as substrate, and the plants were fertilized with a modified Hoagland solution. Vegetative growth and internal nutrient content were compared with control plants with 30 mg L-1 of Cl-, and plants treated with 200 mg L-1 Cl- for 130 days using NaCl in the nutrient solution (5.64 mM). No interaction between NaCl and the rootstocks for the vegetative growth variables was detected neither in K+ internal foliar or root content nor Ca+2 root. With regard to the carbon assimilation rate, the Nabal rootstock showed the highest rates under the NaCl treatment by retaining the highest chloride concentration in the roots and greatly limiting the concentration found in the leaves of the cv. Hass cultivar. It is therefore a promising rootstock for salt tolerance. Key words: Persea americana, chloride, sodium, NaCl, salinity stress, rootstocks. El palto (Persea americana Mill.) es una de las especies más sensibles a la salinidad, debido a que su sistema radical es particularmente afectado por este estrés, es importante identificar un portainjerto tolerante al riego con agua salina. Para encontrar posibles candidatos se utilizó material vegetal del cv. Hass injertado sobre cinco portainjertos, el clonal Duke 7 y los provenientes de semilla, Nabal, Degania 117, Mexícola y Zutano. Plantas de 1 año de edad fueron colocadas en macetas de 55 L, con arena de río como sustrato y fertilizadas con una solución Hoagland modificada. Durante 130 días se comparó el crecimiento vegetativo y los contenidos internos de nutrientes en plantas control con 30 mg L-1 de Cl- y de plantas tratadas con 200 mg L-1 de Cl-, mediante el uso de NaCl en la solución nutritiva (5.64 mM). No hubo interacción entre el NaCl y los portainjertos para las variables de crecimiento vegetativo ni en el contenido interno foliar o radical de K+ ni el radical de Ca+2. A nivel de tasa de asimilación de carbono, Nabal fue uno de los portainjertos que presentó las mayores tasas bajo tratamiento con NaCl, retuvo la máxima concentración de cloruro a nivel radical y limitó en mayor medida la concentración que se encontró en las hojas del cv. Hass, por lo tanto se presenta como un portainjerto promisorio en la tolerancia a sales. Palabras clave: Persea americana, cloruro, sodio, NaCl, estrés por salinidad, portainjertos. Salinity is generally associated to avocado tree cultivation in semi-dry climates (California, Chile, Israel, and Southern Australia), where limited rainfall can result in high salt soil concentrations and poor-quality water (Whiley et al., 2002). The avocado tree is considered to be a sensitive species to salt stress (Steinhardt et al., 1995; Lahav and Laví, 2002a; Bernstein and Kafkafi, 2002; Crowley et al., 2003; Bernstein et al., 2004; Mickelbart et al., 2007). However, different levels of salt tolerance are observed among the three different ecological races where Mexican rootstocks are the most sensitive, Guatemalan rootstocks show an intermediate tolerance, and West-Indian rootstocks are the most resistant (Whiley et al., 2002). Studies carried out by Mickelbart and Arpaia (2002) have shown that different degrees of tolerance can also be observed within a single race, as well as differences in the response mechanisms used. Salt stress is one of the adverse environmental factors influencing physiological aspects of plants which limit productivity at the same time. High salt concentrations in the external solution of the plant cells cause diverse effects that can be summarized in three different types: osmotic drought, toxicity due to high chloride and sodium retention, and nutritional imbalance (Trinchant et al., 2004; Karimi et al., 2005). Different mechanisms have been developed by plants to cope with salinity, such as differential growth rates, morphological adaptations, and adjustments at the osmotic level (Moya et al., 1999). This aspect (osmoregulation) gives plants the capacity to tolerate high-salinity conditions, thus expressing regulative mechanisms that prevent photosynthesis reduction, translocation alterations, photoassimilated decrease, and performance loss. Upper plants can be divided into two distinct groups according to their salt adaptation mechanism: i) those defined as ion-exclusive that prevent the entrance of ions in the soil solution to their tissues and more active areas (leaf buds and expanding leaves), and ii) those that accumulate ions (Caliandro et al., 2000). The study approach was based on these records and the objective was to identify in five different avocado rootstocks which one showed the highest tolerance to NaCl stress by evaluating C-absorption rate, vegetative growth, and chloride and sodium retention at the root and foliar levels. This study was carried out at the School of Agriculture of the Pontificia Universidad Católica de Valparaiso, located in the Province of Quillota (32º 50 S; 71º13 W), Valparaíso Region, Chile. Five different rootstocks were used: one Guatemalan (Nabal), one West Indian ('Degania 117'), one Mexican x Guatemalan hybrid ('Zutano'), and two Mexican (Mexicola and 'Duke 7'). Rootstocks were propagated by seeds, but 'Duke 7' was clonally propagated. The Hass cultivar was grafted onto each rootstock. During October 2006, the substrate was washed off the 1-yr old plants and the root volume was measured by water displacement. Photographs were taken of the roots to take area measurements with image analysis software Sigma Scan pro 5.0 (Systat software, Richmond, California, USA). Plants were then placed in 55 L containers filled with silica sand (82% sand, 14% lime, 4% clay, pH 6.49) as a substrate. All trees were watered on a daily basis using 2 L of a nutrient solution containing 1.17 g L-1 ammonium nitrate, 0.33 g L-1 potassium nitrate, and 0.125 mL L-1 phosphoric acid. This procedure was carried out starting at transplant and for the next 120 days. Treatments started on 12 February 2007. The Hoagland and Arnon (1938) nutrient solution was used and modified according to Maas and Poss (1989). The chloride and Na concentrations in the solution were 0.85 mM chloride and 1.13 mM Na (Electrical Conductivity (EC) = 1.2 dS m-1) in the control treatment, and 5.63 mM chloride and 6.78 mM Na (EC = 1.6 dS m-1) using NaCl in the nutrient solution (5.64 mM). Plants were irrigated twice a day at 13:30 h and 15:30 h, with 300 mL volume each time in accordance with the vapour pressure deficit peak observed at 1430 h. All plants were kept in an unheated greenhouse between February and May at a mean daily temperature of 11.5 °C and 83% mean relative humidity. The length and diameter of three shoots from each plant were measured every 14 days. The scion and rootstock diameter were also measured at 2.5 cm from the grafting area. An IRGA LI-6400 infrared gas analyzer (Li-cor Biosciences, Lincoln, NE, USA) was used on 2 April and 22 May. The C assimilation rate was measured by taking eight healthy and mature leaves (not rapidly expanding) from each plant (N = 100; n = 5). Root volume and area were measured again after 130 days. Then each plant was divided into root system, old leaves (developed before the treatments), and new leaves. Fresh weight from each group was estimated, after which all tissues were quickly washed in distilled water and dried in a forced-air stove at 60 °C for 48 h. The soluble ion concentrations were determined throughout the protocol established by Sadzawka et al. (2004). A completely randomized design was used. Each treatment included 10 replicates (n = 10, N = 100). For internal contents, the samples included tissues from two plants, thus obtaining five replicates per treatment (n = 5). The Tukey (α = 0.05) and Student t (α = 0.05) tests were carried out with SPSS Software (SPSS Inc., Chicago, Massachusetts, USA). When the variance analysis (ANOVA) showed the absence of factor interaction (rootstock x NaCl), significant variances were analyzed (rootstocks and/or NaCl). 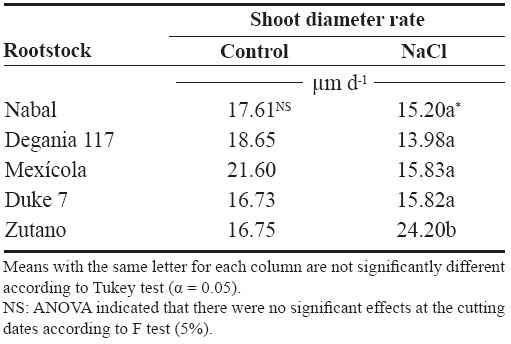 There was no interaction between rootstocks and NaCl in all the vegetative growth parameters, except for the diameter growth rate of the shoots (Table 1). Furthermore, there were no growth rate differences among the different control rootstocks with a mean of 18.27 µm d-1. However, the shoots of cv. Hass on Zutano developed, on the average, 59% faster under the NaCl treatment than other rootstocks. Table 1. Effect of rootstock on diameter variation of avocado cv. Hass shoots. Quillota, Chile. February to May 2007. Sodium chloride only affects the 'Zutano' rootstock. The observed response was to increase the diameter growth rate to 44.5%. Recent studies on avocado trees carried out by Musiyimi et al. (2007a) have shown vegetative growth stimulation under low salinity levels in Mexican plants which can be due to a rise in cellular growth and an increase in cell number as a result of osmoregulation. Other studies carried out by Musiyimi et al. (2007b) with higher NaCl concentrations than those used in this study and a longer stress exposure period show a significant decrease of different vegetative growth parameters. Although there was no interaction effect between rootstocks and NaCl, these affected the evaluated vegetative growth parameters (vigor differences) (Table 2). Table 2. Vegetative growth parameters of avocado cv. Hass on different rootstocks. Quillota, February to May 2007. Nabal showed higher vigor which is expressed as the growth rates of the trunk diameter, root volume, and shoot length, whereas Zutano showed lower vigor. It is important to point out that one of the salt tolerance mechanisms is differential vegetative growth rate. According to Flowers et al. (1988), higher vigor in plant development allows dilution of the salt concentration, thus increasing salinity resistance. It is important to stress the variation of the root volume of 'Nabal' and 'Duke 7' which, on the average, was 1.8 times greater than the other rootstocks (Table 2). This indicates the greater root development capacity shown by these rootstocks. The studies carried out by Bayuelo-Jiménez et al. (2002) on Phaseolus demonstrated that those species naturally showed greater root development, and thus greater shoot development, evidence of a higher salinity tolerance. The latter may be due to the fact that if these would be plants under saline stress, they would expend more photosynthetic energy in producing roots for water collection and/or reduction of water loss, thus allowing the plant to maintain relatively high water potentials. There was no interaction between NaCl and the rootstock. 'Duke 7' showed the lowest percentage in old leaves and roots followed closely by 'Nabal'. 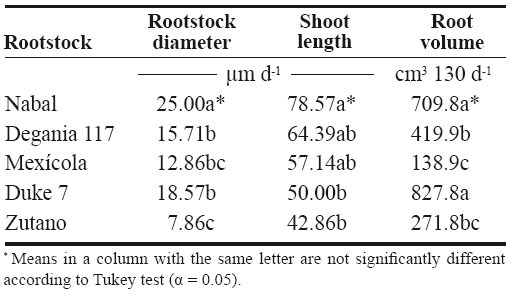 Since the root development rate of these two rootstocks was higher (Table 2), the low percentage of dry matter may be indicating a greater water proportion in the root tissues and/or a better capacity for osmoregulation and toxic osmolyte storage. Dry weight in the old and new leaves after NaCl exposure was reduced 1.13 and 1.38 percentage points, respectively. Decrease in the roots was 0.5 percentage points (Table 3). Ion toxicity under saline stress increases respiration or photosynthesis reduction. The respiratory rate increases even at low salt concentrations (<0.01 M), therefore causing the respective rise of oxygen consumption since under excessive NaCl conditions in the substrate, Na+ promotes ADP and inorganic phosphorus formation from ATP. Consequently, ADP enters the respiratory chain and promotes an increase in respiration (Kasumov and Abbasova, 1998). Both respiration increase and photosynthesis decrease reduce the produced assimilates which will reduce dry matter accumulated in the plant per transpired water unit (Hester et al., 2001). There was an interaction between NaCl and the rootstocks (Tables 4 and 5). Nabal and 'Zutano' showed the highest assimilation rates under saline conditions. Table 4. Rootstock effect on CO2 assimilation rate in avocado cv. Hass in control and NaCl treatments. Quillota, February to May 2007. Table 5. 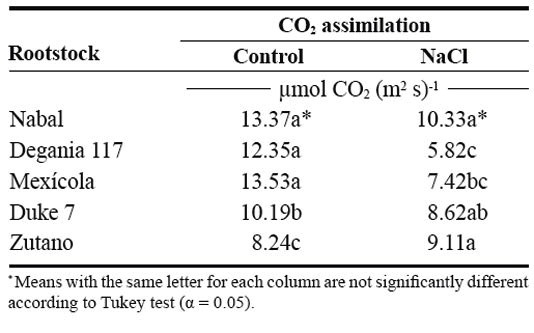 Effect of NaCl on CO2 assimilation rate in avocado cv. Hass. Quillota, Chile. February to May 2007. In relation to NaCl effect (Table 5), a reduction of the assimilation rate was observed in all rootstocks. The highest assimilation reduction (52.9%) was observed with 'Degania 117', whereas lowest rates were obtained with 'Duke 7' (15.4%) and Nabal (22.7%). No significant changes were recorded with 'Zutano'. Reports from Bernstein et al. (2004) showed that the Degania 117 rootstock, though from the West Indian species, is quite sensitive to salt stress, fact confirmed in this study. Growth decrease observed in plants subjected to saline stress is directly associated to the photosynthetic capacity reduction (Sibole et al., 2003). This reduction is related to different physiological plant mechanisms and also to osmotic adjustment mechanisms produced as a result of the toxic ion concentration increases. Among these, we can find the decrease of stomatal conductance, ultrastructural damages reducing the chloroplast activity for CO2 fixation (Netondo et al., 2004), reduction of the Rubisco enzyme activity as a result of Cl- toxicity (Seemann and Critchley, 1985), and the chlorophyll content decrease (Mickelbart and Arpaia, 2002; Musiyimi et al., 2008). 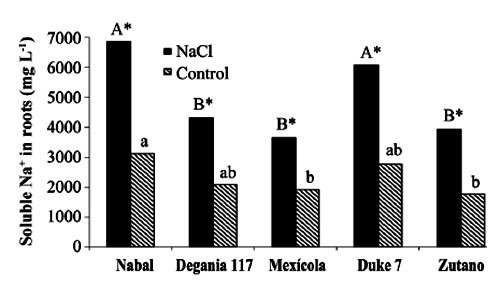 The higher assimilation rate observed in 'Nabal' under salinity conditions may be caused by the lower Cl- concentrations in its leaves (Figure 1), and therefore, by the lower metabolic damage caused by this ion at the foliar level. On the other hand, the higher assimilation rate observed for 'Zutano' may be associated to greater chlorophyll contents at the foliar level (data not shown). Figure 1. Internal content of Cl- in old and new avocado leaves. 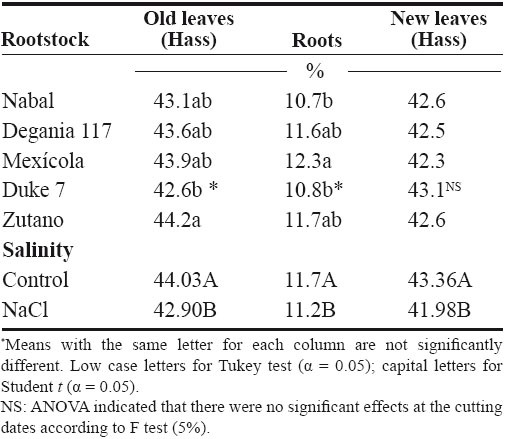 Bars show the effect of rootstocks on NaCl (capital letters) and control (lower case letters) treatments. (Tukey test, α = 0.05). Asterisks show a significant effect of NaCl for each rootstock (Students t test, α = 0.05). Soluble chloride. With regard to old and new leaves, roots accumulated the largest concentration of chloride in the plant (Figures 1 and 2). Figure 2. Internal Cl- content in roots. Bars show the effect of rootstocks on NaCl (capital letters) and control (lower case letters) treatments. (Tukey test, α = 0.05). *Significant effect of NaCl for each rootstock (Students t test, α = 0.05). Figures 1 and 2 show that all rootstocks in the control treatment had a soluble chloride concentration that followed the concentration pattern: roots > old leaves > new leaves. On the other hand, 'Nabal' and 'Duke 7' roots accumulated the highest quantity of chloride in the NaCl treatment compared to all the other rootstocks (Figure 2). 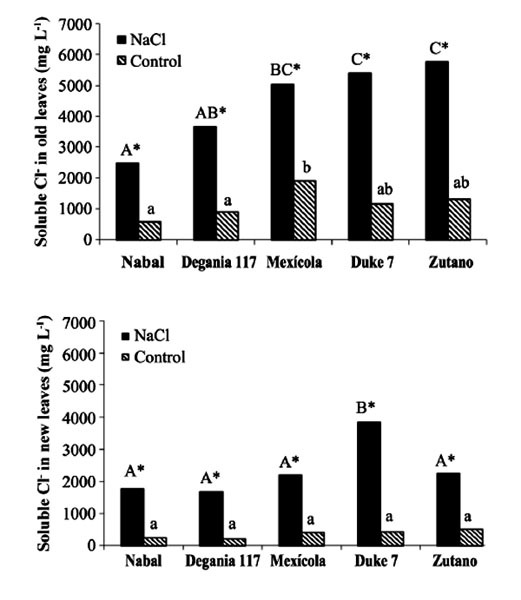 Furthermore, 'Nabal' showed lower concentrations in old and new leaves at the foliar level under the same treatment, whereas 'Duke 7' accumulated the highest (Figures 1 and 2). So, when the salt concentration in the soil solution increases, osmotic and water potential of the substrate decreases, thus posing serious water absorption limitations to the root, and plants must keep a more negative water potential than that of the external environment in order to absorb water (Casierra-Posada and Rodríguez, 2006; Bárcenas-Abogado et al., 2002). Vegetables absorb higher ion concentrations in the Na+ and Cl- soil solution to make a successful internal osmotic adjustment regardless of the toxicity degree in order to reduce the osmotic potential to a level lower than the mean to achieve water absorption. However, once the necessary water for survival has been taken, they store these new ions in the vacuole to avoid the toxic effect (Zhang et al., 1999; Shi and Zhu, 2002). Nevertheless, excessive Na+ absorbed induces a reduction of the K+/Na+ relation where K+ becomes a limiting factor since it regulates osmotic potential for water absorption (Keller and Volkenburg, 1996; Clausen et al., 1997). Transpiration plays a crucial role in the absorption of the mentioned ions that will facilitate absorption and transportation of ions. However, reduction of the transpiration rate in the salinity-exposed plants may be a reflection of the plants defense mechanism helping to avoid the excessive absorption of toxic ions and the subsequent accumulation in the sensitive aerial tissues (leaves and apices). Restriction in the amount of chloride reaching the leaves of any single variety would be part of a salinity tolerance mechanism present in the avocado rootstocks. Then, a lower chloride accumulation is associated to the leaves of the Guatemalans, such as 'Nabal', than in the Mexican race ('Duke 7' or 'Mexicola') (Ben-Ya`acov and Michelson, 1995; Mickelbart et al., 2007). Coincidently, the Oster and Arpaia (1992) and Mickelbart et al. (2007) studies showed that the Toro Canyon rootstock, a Guatemalan x Mexican hybrid, accumulated less chloride in the cv. Hass shoots and leaves than the 'Duke 7' and Thomas rootstocks, both from the Mexican race. Bar et al. (1997) concluded that the high chloride levels found on citrus leaves are associated to high levels of putrescine and low levels of spermine in the leaves. When the difference of the polyamine levels increases, the detrimental effects of chloride increase. Putrescine possibly plays a role in the appearance of toxic symptoms in plants irrigated with water containing a high level of chloride, whereas a protective role is attributed to spermine. Related studies carried out by Cesped et al. (2007) using the 'Duke 7' rootstock showed that it has a low capacity to exclude Cl- at the foliar level, so this rootstock would not be recommended for a salt tolerance improvement program. Considering the high Cl- levels observed in the old leaves of 'Duke 7' and 'Zutano', it could be expected that after a longer exposure period to NaCl both rootstocks would show the characteristic marginal necrosis caused by chloride damage. This necrosis may cause loss of photosynthetic capacity. Though 'Zutano' appeared to be an interesting rootstock when considering its higher growth rates of shoot diameters and high photosynthetic rate when subjected to salt, its high leaf chloride content, it is a low-exclusion Cl- rootstock the same as 'Duke 7' which after a long exposition period would experience a reduction of these parameters. Only 'Nabal' showed the same chloride concentration in the old and new leaves (Student t test, α = 0.05; data not shown) (Figure 1). Chloride was always higher in the old leaves of all the other rootstocks. In general, all plants subjected to saline stress tend to accumulate a higher salt concentration in the old leaves than in the new ones (Yeo and Flowers, 1982, Khan et al., 2004). Roots accumulated a higher Na concentration than the old and new leaves. There were no differences in Na concentration between old and new leaves. Old and new leaves accumulated a mean of 203.6 and 212.1 µg g-1, respectively, being among some of the lowest values in the normal range registered in avocado (Lahav and Aycicegi-Lowengart, 2003; Lahav and Whiley, 2002b). Chloride is not generally retained in the roots of the avocado rootstocks, except for 'Nabal' in this study. Avocado rootstocks considered to be salt tolerant are capable of restricting the Na that reaches the leaves by sequestering it in the tissues located under the grafting area (Ben-Ya`acov and Michelson, 1995; Mickelbart and Arpaia, 2002; Mickelbart et al., 2007). The effect of the Nabal rootstock is clear even in the control treatment where root concentration is significantly different to other rootstocks. Sodium concentration accumulated by 'Nabal' in the NaCl treatment stood out although they are statistically equal. This concentration was 42.6% higher than in 'Duke 7' (Figure 3). This will probably allow 'Nabal' to be subjected to higher and longer concentrations, maintaining low Na in the leaves. Figure 3. Na+ internal content in the roots. Bars show the effect of rootstocks on NaCl (capital letters) and control (lower case letters) treatments. (Tukey test, α = 0.05). *Significant effect of NaCl for each rootstock (Students t test, α = 0.05). In connection with this, a study carried out by Kadman (1963) also reported different Na+ concentrations in the avocado plants of different races, which had been subjected to saline stress. In this study, the Guatemalan and West Indian races showed a concentration pattern in roots/leaves of 3-4:1, while the Mexican races showed a ratio of 1:2. The latter suggests the presence of some kind of barrier in the roots that may not be present in the Mexican race. On the other hand, studies carried out by Dawton (1978) showed Na+ entrance or accumulation is related to the increase of tissue succulency (fresh weight/dry weight increase) and would represent an adaptive response mechanism of some avocado ecotypes allowing accumulated ion dilution. No interaction between the NaCl and the rootstocks on the K soluble level in the tissues was observed (Table 6). Mickelbart et al. (2007) observed a decrease of the K root concentration and an increase at the foliar level caused by a rise in salinity. 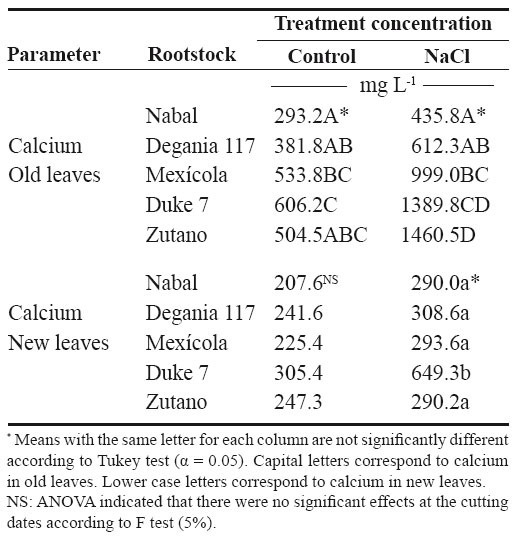 In this trial, NaCl treatment reduced K by 12.8% in the roots and increased it 14.7% and 17.1% in old and new leaves, respectively (Table 6). Furthermore, Mickelbart et al. (2007) associated K and sodium at the root level through a competitive relationship which is demonstrated by K reduction and Na increase (Figure 3). On the other hand, Lahav et al. (1993) and Ramoliya et al. (2004) suggested foliar K increase results from a salinity response that transfers potassium from the roots to the leaves, thus increasing the availability of this cation at that level, due to its importance as an osmotic regulator on the stomatal opening and closure. Table 6. K+ and Ca+2 concentrations (µg g-1) in different avocado tissuesfor rootstock and NaCl treatments. A rootstock effect was observed only at the root level. Zutano showed the highest concentration, which was 1.3 times greater than the mean of the other rootstocks (Table 6). An interaction between NaCl and the rootstock used was observed in old and new leaves (Tables 6 and 7). 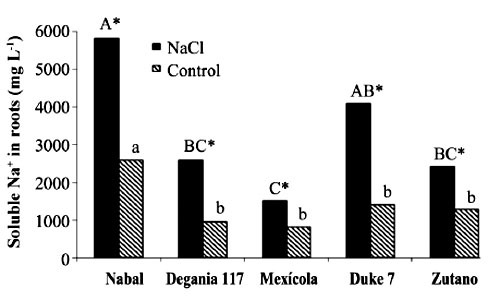 In the old leaves, NaCl caused a Ca concentration increase in all rootstocks, though 'Nabal' showed a concentration statistically equal to the one observed in the control situation. 'Duke 7' and 'Zutano' showed the greatest increases, 1.3 and 1.9 times, respectively. In the new leaves, NaCl significantly increased the concentration of 'Duke 7' with a value 1.1 times greater (Table 7). Table 7. Effect of rootstock on calcium concentration in old and new leaves from cv. Hass avocado in control and NaCl treatments. Quillota, Chile. February-May, 2007. According to Musyimi et al. (2007), as salinity increases in the root area, Ca+2 plant requirements also increase. Therefore, some tolerance to the saline concentration may be observed for 'Nabal' where no effect on the Ca concentrations at the foliar level was observed. Finally, it is worth mentioning that the authors are carrying out field evaluations in productive areas presenting salinity problems in irrigation water to corroborate the observations made under the controlled conditions of this study. Restriction of ion transport to the leaves is one of the mechanisms associated with salinity tolerance of avocado where 'Nabal' seems to show the highest probability of being a rootstock that provides it. This was the rootstock that also showed the highest rates under NaCl treatment. Furthermore, it retained the greatest chloride concentration at the root level and also greatly limited the concentration found in the old and new leaves of cv. Hass. Nabal was the only rootstock that accumulated statistically equal chloride concentrations between the old and new leaves since the other rootstocks always showed a higher concentration in the older leaves. This could be a tolerance strategy attempting to distribute the chloride ion in more tissues, thus delaying the phytotoxic effect in the old leaves and maintaining that area photosynthetically active for a longer period of time. Research was financed by the FONDEF project D04I1346 "Agronomic evaluation and propagation of new rootstocks and varieties of avocado in different agroclimatic areas of Chile". Special thanks to the personnel of the Propagation and Soil Analysis Laboratories of the Faculty of Agronomy of the Pontificia Universidad Católica de Valparaíso for making this research study possible. Kozlowski, T. 1997. Responses of woody plants to flooding and salinity. Tree physiology. Tree Physiology On-Line Monograph Nº 1. (). Heron Publishing. Available at http://treephys.oxfordjournals.org/cgi/reprint/17/7/490 (accessed September 2007).